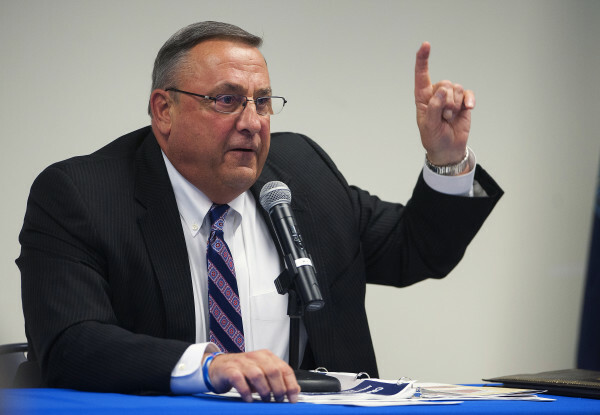 AUGUSTA, Maine — During a fiery news conference that lasted nearly an hour, Gov. Paul LePage pledged Friday to veto every bill sponsored by a Democrat until his opposition relents and accepts his constitutional amendment to eliminate Maine’s income tax. LePage this year has proposed a constitutional amendment that would eliminate the state’s income tax by the year 2020. Republicans, who have shied away from the governor’s more comprehensive tax reform efforts, have rallied around the amendment. Democrats have opposed it, sparking LePage’s trademark fury during a news conference at the Blaine House. Efforts to amend the state’s Constitution require not only the support of two-thirds of the Legislature but the approval of Maine voters. LePage has said voters should be given the option of eliminating the income tax, which accounts for about half of all state revenue. “If the Democrats are going to disenfranchise the Maine people, then the governor of Maine is going to make sure that every bill that comes down from the House and the Senate with a Democrat sponsor will be required to have a two-thirds vote, because I’m going to veto every one, and I did a bunch this morning,” LePage said. Two-thirds support in both the House and Senate is needed to override a governor’s veto. So far, 205 bills have been sent by the Legislature for LePage, according to official legislative figures. Of those, LePage has vetoed 26. The governor’s bill, LD 1637, was rejected by majority Democrats on the Taxation Committee on May 13. It has yet to come up for additional votes in the full Legislature. It could likely pass in the GOP-controlled Senate, but given Democrats’ questions about how to pay for such a monumental reduction in state revenue, it’s unlikely to garner enough support to pass in the House, which they control. House Majority Leader Jeff McCabe, D-Skowhegan, was the “leader in the room” who earned LePage’s ire. McCabe said that because any bill that clears the Legislature must already win the support of Republicans in the Senate, bills that LePage pledged to veto will always be bipartisan. In other words, the governor won’t only be punishing Democrats if he follows through with his threat. LePage’s news conference took place as all eyes in the State House look toward the budget-writing Appropriations Committee who, along with legislative leaders, are working to hammer out a two-year budget plan. The sticking point, by all accounts, is whether to include tax reform in the budget and, if so, what should it look like? LePage kicked off that conversation in January when he proposed a $6.57 billion biennial budget that included massive income tax cuts, an increase in the sales tax and an elimination of the estate tax, as well as other provisions. Democrats balked at LePage’s income tax scheme, arguing it was too generous to the wealthy and unpaid for. Republicans were skeptical of a sales tax increase similar to one many of them had campaigned against in 2010. Since then, Democrats and Republicans have unveiled their own tax reform proposals, but agreement is elusive. LePage conceded Friday that his plan was “dead” and confirmed that in talk to hammer out a new deal, he and Senate Republicans are not on the same page. Meanwhile the clock ticks down toward the June 17 deadline for the Legislature to adjourn. Sen. Justin Alfond of Portland, the top Democrat in the Senate, said Friday that he is confident a “strong budget” is still possible, but repeated earlier concerns that tax reform is impossible because Maine Revenue Services — an agency under LePage’s control — has not given lawmakers analyses of the various tax reform proposals on the table. “We’re looking at all options, but when you don’t have the support of MRS, when you don’t have the support of the governor’s office, it’s very difficult to do complicated tax changes,” he said.